Even law-and-order sheriffs support helping convicted felons become full-fledged citizens again. TALLAHASSEE –For only the third time this year — but this time under a withering national media glare — Florida's highest elected officials sat in judgment Tuesday of people whose mistakes cost them the right to vote. During a five-hour hearing, 90 felons made their case to Florida Gov. Rick Scott and three members of the Cabinet, asking to have their rights restored. It was a packed house in the Cabinet room of the state Capitol, as Tuesday's hearing drew reporters and cameras from, among other outlets, NPR, The Huffington Post and The Guardian. The hearings typically attract one or two members of the Tallahassee press corps. Only two days before, Florida's restoration of rights process was skewered on national TV by John Oliver of the HBO program Last Week Tonight. He devoted a 13-minute segment to the Florida clemency system, calling it "absolutely insane" and mocking Scott for creating "the disenfranchisement capital of America." Many had substance abuse problems that led to crimes. Some never served prison time, but were placed on probation and did service work. About 10,000 have filed appeals that are pending. Douglas Cobb is a pastor, a youth baseball coach and a devoted father in Dixie County whose drug abuse made him commit non-violent crimes a long time ago against family members and friends. Cobb was granted a full pardon from Scott and the Cabinet with the help of a long-time friend, Dixie County Sheriff Dewey Hatcher, who vouched for his neighbor's character. "I've known Doug since he was a boy, and I remember when he came back to Dixie County from rehab," Hatcher testified. "I've got all the confidence in him. If not, I wouldn't be standing here." "I'm feeling awesome. I just thank God," said Cobb, accompanied by his wife and three young children. Speaking later to reporters, the sheriff said of Florida's restoration process: "It should be easier. Until you go through this, you don't know what an arduous process it is. A lot of people get discouraged. It takes a lot." The sheriff's view brought a show of support on Twitter from a key senator in Florida, Republican Jeff Brandes of St. Petersburg. Anthony Benitez, 52, of Tampa, a carpenter with a college engineering degree, didn't get his rights back, 11 years after he petitioned the state. He said he has overcome drug and alcohol problems that led to multiple DUIs and fights with police officers. "This was all 21 years ago. I'm not the same person," Benitez pleaded. Scott took Benitez's case under advisement, with no action. "You're no longer doing drugs?" Scott asked one man. "Why not?" Scott, the Republican nominee for U.S. Senate against Democrat Bill Nelson, supports the existing system. With his support, the state is now appealing U.S. District Court Judge Mark Walker's decision to strike down the rights restoration system as arbitrary and unconstitutional. The political committee that supports Amendment 4, Floridians for a Fair Democracy, based in Clearwater, spent $3.579 million in the week ending Aug. 31, with nearly all of the money spent on a "media buy," which likely means TV advertising. Also receiving an unconditional pardon Tuesday: Trevon Simmons, 38, who now lives with his wife in North Carolina and runs a program in Fort Pierce, Fla., that helps young people stay out of trouble. The program is called Creating Tomorrow's Leaders. Simmons served seven years in prison for an armed holdup of a store and left prison in 2005. 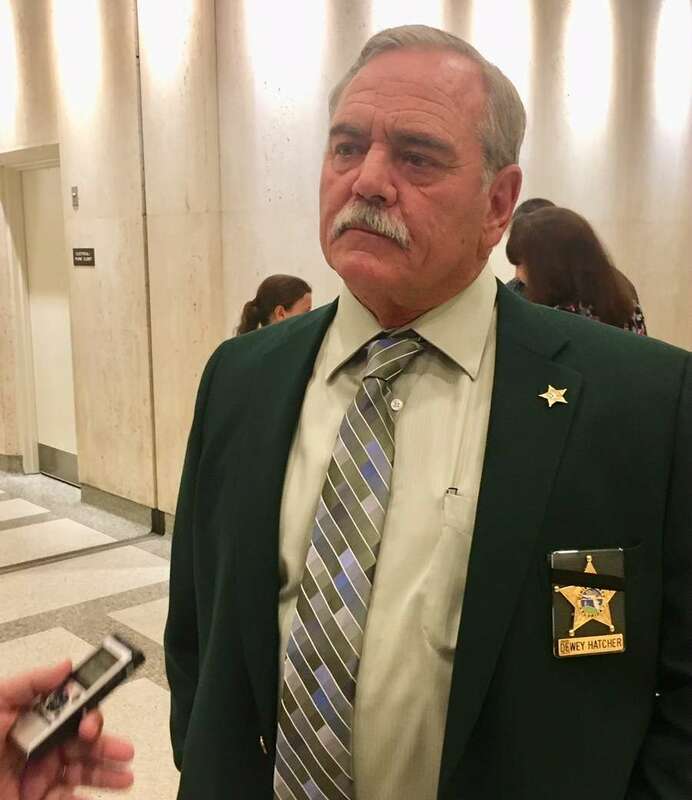 The police chief of Fort Pierce, sheriff of Port St. Lucie County and Rep. Larry Lee, D-Port St. Lucie, all supported the petition of Simmons, who took full responsibility for his past behavior and said he didn't mind having to work for years to regain his rights. "No matter your past, who you are and where you're headed means a lot more," Simmons said. "I wanted to vote in every election but couldn't. It was like having to sit on the sidelines and watch a game you want to play in."